More than 70 Delta Zeta collegians and alumnae gathered at Sky Philadelphia on October 6, 2018 for Truly Connected: Philadelphia. This event brought sisters from around the country together for professional development and sisterhood, to learn from one another and create networking opportunities. Blakley Schwope and Cynthia Reyes, both collegiate members of the Delta Theta Chapter, University of Houston, traveled all the way from Texas to Philadelphia to participate in this signature event. Blakely and Cynthia had the opportunity to learn from Keynote Speaker, Jennifer Yohe Wagner, Lambda Epsilon, University of Pittsburgh/Johnstown, who serves as the Senior Vice President, Procurement for Comcast in Philadelphia. She reminded Truly Connected participants that if you do not risk anything, you risk even more, and to be better today than you were yesterday. Cynthia, a senior getting ready to graduate in May 2019, said that Jennifer reminded her that change is good. Getting closer and closer to “the real world,” she felt the Truly Connected experience would help prepare her by making connections to Delta Zetas who are already in their careers. Both Blakley and Cynthia valued the opportunity to learn about their personal brand, which was discussed during the breakout sessions, an opportunity for members to participate in small group discussions around a particular career topic. Blakley combined those conversations with information she learned from the Alumnae of Achievement Panel Discussion. “My voice of character, context, clarity, curiosity and connection are all things I can use to help build my own personal brand and become successful,” she said. The Alumnae of Achievement Panel was composed of Jennifer Wagner; Nathaly Davila, Pi Theta, Rollins College; Jennifer Galle, Delta Sigma, Truman State University; and Christina Edwards, Beta Delta, University of South Carolina, and proved to be a highlight of the day. 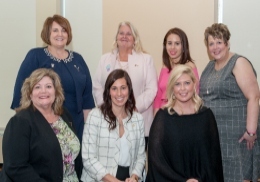 Both Blakley and Cynthia benefited from Delta Zeta donors giving graciously, ensuring events like Truly Connected: Philadelphia provide lifelong education and learning for Delta Zetas at all stages of their personal and professional lives.